I read Nalo Hopkinson’s Sister Mine a couple of years ago after enjoying some of her short work in the anthologies After (ed. by Ellen Datlow and Terri Windling) and Unnatural Creatures (ed. by Neil Gaiman), but I’ve just never quite managed to get around to reading more of her novels. When I saw that she had a new collection of short fiction coming out this year, though, I was ecstatic. Falling in Love With Hominids doesn’t disappoint. It opens with “The Easthound,” which was originally published in After and is the first story I ever read by Nalo Hopkinson, and even though I was anxious to move along to some stuff I hadn’t read it was nice to reread something I liked so well the first time I read it. Besides this first story, though, everything else in the collection was new to me. While I didn’t love the longer piece, “Ours is the Prettiest,” I do think it’s inspired me to check out the Bordertown books. I’m not always into that sort of modern faerie stuff, but I feel like I would have loved this story if I was more familiar with the shared world it was written in. 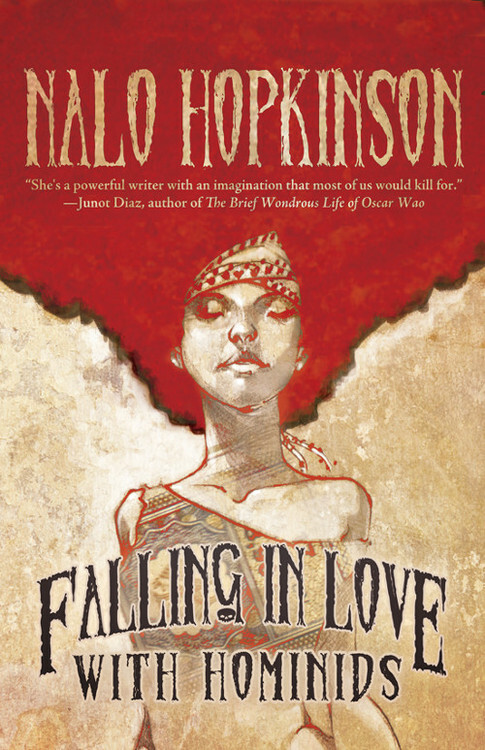 Overall, Falling in Love With Hominids is, I think, a great introduction to Nalo Hopkinson. There’s a nice variety of stories here both in subject matter and length, and I actually found some of the shorter stories to be the strongest pieces in the lot. Hopkinson’s introduction is nice, and I like the little paragraphs at the start of each piece. It’s a common thing in story collections, but I always feel like these bits of extra info give better context for the stories and let me get to know the author a little. Here, it helps that Nalo Hopkinson seems to be someone eminently worth knowing. This review is based on an ARC received through NetGalley. Falling in Love With Hominids will be published on August 11, 2015 and can be pre-ordered from Tachyon Publications.